Ex-Detainee Describes Torture In China's Xinjiang Re-Education Camp "They made me wear what they called 'iron clothes,'" the man tells NPR, describing a 50-pound metal suit he was forced to wear for 12 hours. When he returned home, people were afraid to speak to him. Uighur security personnel patrol near the Id Kah Mosque in Kashgar, a city in northwestern China's Xinjiang region, in 2017. 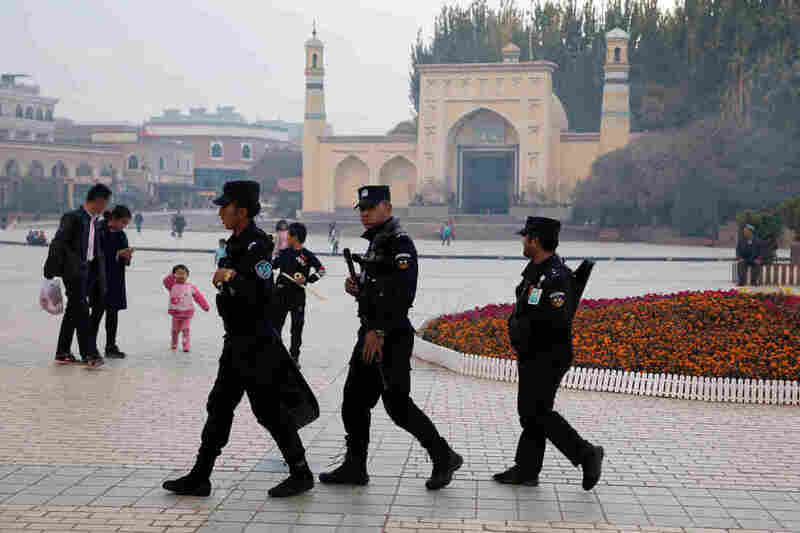 Xinjiang authorities have detained members of the Uighur ethnic minority, who are largely Muslim, and held them in camps the authorities call "education and training centers." By the time Chinese guards began torturing Kayrat Samarkand inside a re-education camp last spring, he says his life had prepared him for this. 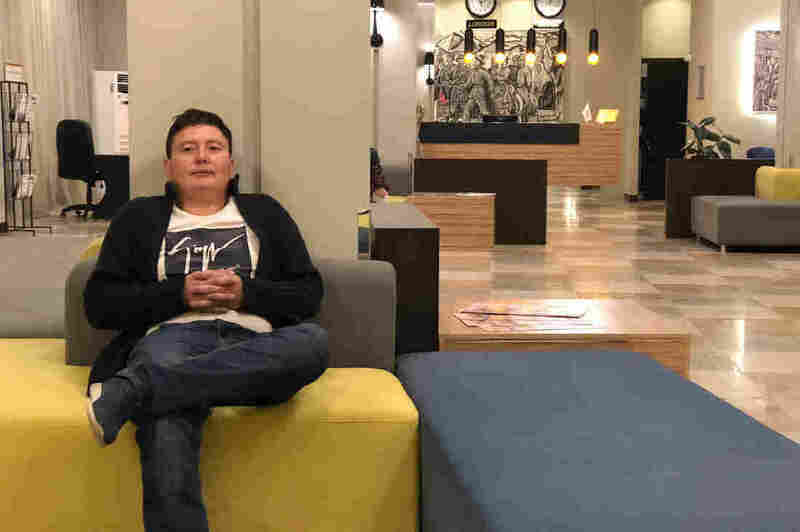 Chinese citizen Kayrat Samarkand, pictured in a hotel in Almaty, Kazakhstan, says he was detained in a Chinese re-education camp in his home region of Xinjiang for months. He says he was tortured and finally released after trying to kill himself. That's why, nearly two decades later, when the police from his home village invited him for a meeting, he went straight to the station to see how he could help. It was Oct. 19, 2017. "They sat me down in a tiny room with cameras aimed at me," Samarkand remembers. "They cuffed me and interrogated me for 72 hours." Samarkand had spent eight years working in construction in Kazakhstan and had recently returned to China to see friends. He says the police kept asking him what he did in Kazakhstan, whom he met with and how religious he was. He says they were never satisfied with his answers. Finally, they let him sleep inside the cell, but he says speakers installed in the ceiling kept waking him up. "They woke me up playing the call to prayer," says Samarkand. "I think they were testing me to see if I'm religious. Later on, they woke me up with a recording of a child speaking Kazakh. The child said, 'Daddy, Mommy, please help me! You've seen what the Chinese are doing. They're awful.' Again, I think they were testing my response." Samarkand says he was transferred to a re-education camp, where people were separated into three groups: those who were religious, those who were suspected of being criminals, and those, like him, who had traveled abroad. All of them, says Samarkand, had one thing in common, though: They had grown up in Muslim families and communities. They made me wear what they called 'iron clothes,' a suit made of metal that weighed over 50 pounds. ... They made people wear this thing to break their spirits. After 12 hours, I became so soft, quiet and lawful. He says he was assigned to cell No. 6 with 15 other detainees. The group was given mattresses and he slept next to the only toilet in the cell. His description of the routines inside the camp match those of other detainees who shared their stories with NPR. "At first we have 12 people, but after many days, we reached 28 people," remembers another former detainee, a middle-aged ethnic Kazakh man who didn't give his name for fear of retribution by Chinese authorities. In addition to living in cramped quarters, he says inmates had to sing songs praising Chinese leader Xi Jinping before being allowed to eat. He says detainees were forced to memorize a list of what he calls "126 lies" about religion: "Religion is opium, religion is bad, you must believe in no religion, you must believe in the Communist Party," he remembers. "Only [the] Communist Party could lead you the to the bright future." A typical day at the camp would start at 6 a.m., he says, when detainees were ordered to sing along to songs played over the camp's PA system, praising China's Communist Party. After breakfast in a canteen, he says they were led to classrooms, where teachers taught detainees words in Pinyin, China's Romanized writing system, alongside their Chinese-character equivalents. They were also given books about Lei Feng, a Chinese soldier regarded as a model of selfless devotion to communism, and were periodically quizzed by teachers on their knowledge of the "126 lies" about religion. Instead of re-educating him, he says his experience at the camp "made me hate the government even more." He says nobody at his camp was beaten or tortured — just threatened. Samarkand was not so lucky. He says he was tortured after a guard ordered him to make his bed, only to mess it up and order him to do it again. After the fourth time, Samarkand says, he picked up the mattress and threw it at the guard. "They made me wear what they called 'iron clothes,' a suit made of metal that weighed over 50 pounds," says Samarkand, drawing a picture of the device on a piece of paper. "It forced my arms and legs into an outstretched position. I couldn't move at all, and my back was in terrible pain." Samarkand says after half a day of standing like this, he did whatever they told him. "They made people wear this thing to break their spirits. After 12 hours, I became so soft, quiet and lawful." He says he chanted "Long live Xi Jinping" when ordered to, sang patriotic songs and never questioned a guard again. Samarkand was finally allowed to leave the camp, he says, after he attempted to kill himself by banging his head as hard as he could against a wall, which only managed to knock him out. He woke up in a hospital. "They X-rayed my head and gave me some decent food, which I hadn't had in a very long time," he remembers. "Later, they told me that attempting suicide would lengthen my detention by seven years. I began to cry. I sobbed. That changed their minds, and they decided to release me." Samarkand says they gave him all his belongings, and he walked for hours along the road back to his home village. "When I arrived back home, nobody in my village would talk to me because they were scared to talk to someone like me who had been in the camps," he says. "The village had changed. There were police everywhere, cameras on all corners and nobody even greeted each other on the street anymore. Traditional patterns of life in the village had been erased." On March 14 of this year, Samarkand re-entered Kazakhstan. These days, he works two jobs in the city of Almaty. He says he's planning to get married soon and needs to save money. When asked if the camps truly "re-educated" him, he tells a story of his first night back in Kazakhstan, where he stayed at a motel near the border. "People were talking loudly in the next room over," says Samarkand. "There were three Chinese businessmen, all oil company employees. I can't explain it, but I snapped. I wanted to hurt them because they were Chinese. I was so angry. I entered their room and I beat them up." When the Kazakh police arrived, Samarkand says they arrested him. He says the police told him they were charging him with assaulting foreigners. Samarkand says he reached into his pocket, withdrew his Chinese passport and threw it at the officers, telling them: "I'm a foreigner, too." Dinara Saliyeva contributed to this report.